Austria's conservative leader says he has invited the far right for talks to form a coalition government. Sebastian Kurz said his People's Party and the Freedom Party (FPÖ) had similar positions on tax cuts and immigration controls. The step paves the way for the FPÖ's return to government after more than a decade in opposition. But Mr Kurz warned that his government could only be pro-European, in contrast to the Eurosceptic view of the FPÖ. The People's Party won last week's parliamentary election but is well short of a majority. The only other option available to Mr Kurz to form a majority government is a coalition with the Social Democrats. The last alliance between the Social Democrats and the conservatives fell apart this spring and there may be reluctance to renew it, correspondents say. Mr Kurz, 31, told journalists: "The goal is clear, to form a stable government with a solid majority in parliament. If that's not possible, a minority government is definitely an alternative." The Freedom Party was launched in 1956 by ex-Nazis with anti-immigrant and anti-EU positions. It has, however, softened its image in recent years and its candidate was narrowly defeated in last year's presidential election. Immigration was the dominant issue in the run-up to last week's election, and Mr Kurz moved his party to the right in the wake of Europe's 2015 migrant crisis, a stance that proved popular with Austrian voters after a huge influx of undocumented migrants and refugees from the Middle East and North Africa. 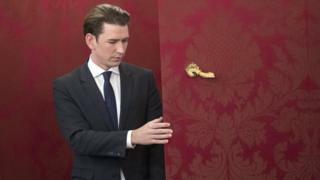 The Freedom Party had previously accused Mr Kurz of stealing its policies, and analysts say an alliance with them could prove controversial among Austria's EU counterparts.